Antivirus is the most fundamental security function, critical to keeping connected machines safe from malware. Using the leading AV engine powered by Kaspersky Lab, GFI OneGuard delivers real-time protection from the latest threats. Using agents installed on each device and managed from a central dashboard, you can control scans, updates and every aspect of virus protection. Software updates are an essential defense mechanism for IT as well as ways to add features, fix bugs and optimize code. It is also a huge resource overhead that takes time and expertise to perform. GFI OneGuard uses proprietary GFI LanGuard technology to monitor patch status and roll out patches to hundreds of machines at once. 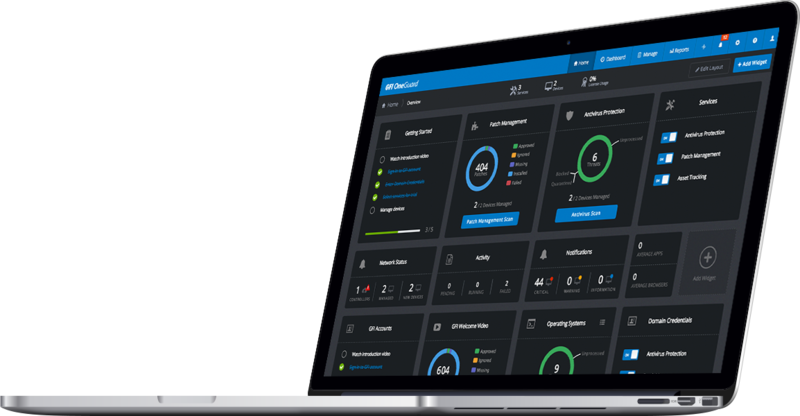 You have full control of this platform as patch management can be fully automated or manually controlled according to need – all from a simple centralized UI. Keeping track of what exactly you have connected to your network and where it is located for network configuration purposes can be quite a challenge. GFI OneGuard makes this process easy thanks to our device discovery engine which crawls your network to audit windows devices that are connected. It can track and report hardware, software, patch levels and so much more, even on remote systems! System security through protection and awareness is at the core of GFI OneGuard. That’s why we integrate Kaspersky Lab antivirus at the centre of our solution. Kaspersky Lab is one of the leading, and one of the most respected providers of antivirus solutions. The antivirus within GFI OneGuard delivers real-time protection for all your connected Windows devices. Install an agent on each machine and control everything from the console. It’s an elegant, yet powerful way to protect your network. Lack of communication/alerting on system events, outages or downtime will be a thing of the past with GFI OneGuard’s messaging tool. Administrators can broadcast messages to all users, groups, departments or whoever they like within your network to let them know about downtime or alert to critical issues. The messaging component of GFI OneGuard is a small but very important element. While it may not pack the punch of antivirus, it is the one method to keep users and managers happy and up to date with what’s going on. Keeping up with software and OS patches on a busy network is a vital task of any IT admin. Yet with multiple operating systems, device types and requirements, how are you going to manage everything? GFI OneGuard can help. The patch management element of GFI OneGuard allows you to scan the network for all connected devices, check what software is installed, detect any missing patches, broadcast updates when and where you see fit. One of the major advantages of using GFI OneGuard vs. traditional point solutions is that as an administrator, you also gain from much simplified licensing procedure. Instead of having to deal with different vendors, with different billing/invoicing methods, and the financial/legal paperwork that ensues, you will be billed for the services used only once for the duration of your agreement. Just one invoice/bill per year for everything you need to keep the network in tip-top shape. To effectively manage a network, you have to know what’s truly in it. That’s where asset tracking comes in. GFI OneGuard makes it easy to identify and track every connected device on your networks anywhere in the world. 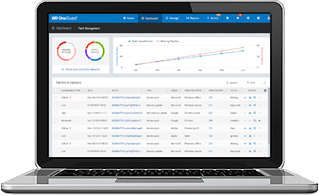 Perform network and software audits from the console and leave the system to manage everything. GFI OneGuard will seek out and assess every device it finds and report back on what and where it is, what software it is running, whether it has any vulnerabilities and dozens of other metrics. This sounds like quite a basic feature, but in reality, you will be surprised of how often this is needed. No need to call up the user… asking them to restart. Administrators have the ability to remotely force shutdown a machine, and GFI OneGuard takes care of alerting the users and giving them notice as well as a countdown when the action will be taken. Reporting is the one way you can make sense of masses of data. Whether you need to analyse resources, report on hardware or software, prepare a business case for upgrades or a multitude of other reasons, the reporting engine in GFI OneGuard can provide it. A wide variety of reports are available for use which have the necessary filters to customize to the data you wish to extract. Reports can be generated in PDF or Excel giving you all the flexibility that is required. 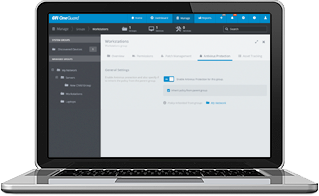 GFI OneGuard is not an on-premise only, or a cloud-only platform – it can be deployed any way you like it. It can live wherever you want it, in any way your infrastructure demands. No other solution in the market is as flexible as this. These core services are just the start of what GFI OneGuard platform will ultimately become. Other services on the product roadmap include device control, server and services monitoring, web filtering and event log management.The platform and all of its services will constantly evolve with new tools and services to help you manage your business networks efficiently and with minimal effort. Microsoft .NET Framework 4.5.1: If not found, this is automatically installed by GFI OneGuard during installation. ASP.NET 4.5.1: If not found, this is automatically installed by GFI OneGuard during installation. Developer note: There are no videos for OneGuard (that I know of), but this section is being used in the construction of the master template. Browse the GFI OneGuard knowledge base. Find out how to configure GFI OneGuard in different environments, and learn how to set up advanced features. Review system requirements and follow the easy steps in this guide to successfully deploy and test your GFI OneGuard installation. When planning to install GFI OneGuard in your environment, there are various considerations that affect how the software gets deployed, such as network segmentation and size. Use this form for information on special considerations for your environment. Learn how GFI OneGuard works and the roles of the different components that make up the solution. Information on deployed agents for the end-users of GFI OneGuard. GFI and FB Security Group does not do any form of refund. We encourage and highly recommend that you take advantage of their “Try before you buy” policy: Use the 30-day free trial period to thouroughly test and evaluate the product before purchasing.